Nearly 47 million of us—14.8% of Americans—live in poverty. Staggering as this number is, it’s a conservative estimate, and one that doesn’t account for the millions more living in “liquid asset poverty,” just one emergency away from financial ruin. Perhaps more troubling about this data—released today by the U.S. Census Bureau—is that it remains virtually unchanged, marking the fourth year in a row in which the rate of poverty in the US hasn’t budged. Although these data don’t provide much reason to rejoice, there is some good news. This year marks the first time the Census Bureau has also released updated data on the Supplemental Poverty Measure simultaneously with the official poverty figures. This is a victory for advocates because it offers an alternative to measuring poverty, which experts and researchers have argued for years fails to reflect the full amount of income a family needs to live in our current economy. By this measure, 15.3% of Americans are living in poverty—1.4 million more households than are accounted for by the federal poverty guideline measure. While that number is far too high, having a more accurate estimate of who lives in poverty is critical for organizations like CFED who are working to create an economy built on opportunity and inclusion. Yet even the supplemental poverty rate still only captures one aspect of a family’s financial life: its income. While income helps families get by, we know that assets help families get ahead. Assets are crucial to a family’s financial well-being and matter economically, socially and psychologically. By not capturing families’ assets, federal poverty measures fail to take into account the financial fragility of a wide segment of our population. At CFED, we use the concept of asset poverty and liquid asset poverty to broaden our understanding of financial instability. These measures take into consideration the assets a family has to weather a financial storm such as a job loss or medical emergency, defined by their ability to live for three months at the poverty level. By these measures, far more Americans are living in a state of financial vulnerability. According to CFED’s latest Assets & Opportunity Scorecard data, 25.4% of households in the US are asset poor, meaning that they lack the net financial resources—money in the bank, assets in a home or car—to weather a job loss or other emergency for three months. Still more troubling, 43.5% of households are liquid asset poor, meaning they lack the liquid assets (i.e., cash or assets easily converted to cash) needed to make it through an income disruption. Our partners agree that true economic security means much more than having an income just above the federal poverty threshold. In the coming weeks, CFED’s team of expert researchers will join the national conversation about poverty and financial security through a series of blog posts that dig deeper into the new poverty data, as well as the data on health insurance coverage also released today and the results of the latest American Community Survey coming out tomorrow. We believe these analyses are critical as they inform the strategies CFED and our partners will advance as we work toward building the opportunity economy we all envision. To look up estimates of asset poverty and liquid asset poverty in your community, visit the A&O Local Data Center. By sharply expanding the Housing and Urban Development Department’s (HUD) Moving to Work (MTW) demonstration, the Senate Appropriations Committee’s 2016 funding bill for HUD and the Transportation Department would likely mean higher rents that would make it even harder for some of the nation’s most vulnerable families to keep a roof over their heads. Normally, families assisted through public housing and Housing Choice Vouchers pay 30 percent of their income for rent, but housing agencies can require them to pay $50 a month, even if that exceeds 30 percent. MTW allows waivers of this limit (and many other program standards) and more than half of the 39 agencies in MTW today have raised rents for at least some families with little or no income — in several cases to $200 or more. These amounts may appear modest, but many families struggle to pay even $50 a month. In their new book, $2 a Day: Living on Almost Nothing in America, Kathy Edin and Luke Shaefer find that 1.5 million families with about 3 million children had cash incomes below $2 per person per day in early 2011. These families receive little income from work (despite often intensive efforts to find and keep a job) and usually no cash assistance, and they struggle to get small amounts from activities such as donating plasma or recycling cans. Rental assistance can greatly reduce their risk of living in severely overcrowded housing, bouncing from one temporary double-up to another, or becoming homeless. But minimum rent policies can jeopardize these benefits by making it harder for the poorest rental assistance recipients to hold their lives together. Both MTW and non-MTW agencies must have policies to exempt families facing hardship from minimum rents, but these typically provide little protection. That’s partly because they require destitute tenants, many of whom have little education and may have trouble meeting bureaucratic requirements, to seek exemptions. For example, Edin and Shaefer report on a family of four that couldn’t pay a $25 public housing minimum rent and — despite the theoretical availability of hardship exemptions — was evicted and wound up in a motel room “that was overrun by bedbugs and had no kitchen, waiting for space to open up at the only family shelter in town.” A 2010 HUD study found that 82 percent of housing agencies that imposed minimum rents exempted less than 1 percent of affected households. In recent years Congress has considered raising the $50 cap on minimum rents at all non-MTW agencies but has wisely refrained from doing so, partly due to the risks for vulnerable families. Congress should also prevent widespread minimum rent increases through MTW, by rejecting expansion of the demonstration (which poses a number of other risks as well) or enacting reforms to protect the neediest families. An estimated 17.4 million households with 48.1 million people were “food insecure” in 2014, meaning they had difficulty affording adequate food at some point in the year, the Agriculture Department (USDA) announced today. At 14 percent, the food insecurity rate is not statistically different from 2013. Though the rate has fallen since 2011, it remains well above pre-recession levels (see graph). Some 15 million children lived in food-insecure households in 2014. While adults often shield children from food insecurity, about 7.9 million children lived in households where at least one child experienced food insecurity at some point in the year. Over the three-year period of 2012-2014, 14 states had food insecurity rates higher than the U.S. average of 14.3 percent; they include Mississippi (22 percent), Arkansas (19.9 percent), Kentucky (17.5 percent), Texas (17.2 percent), and Ohio (16.9 percent). (The report uses three-year averages due to small sample sizes.) Twenty states had rates below the U.S. average, including North Dakota (8.4 percent), Massachusetts (9.6 percent), New Hampshire (10 percent), Virginia (10.1 percent), and Minnesota (10.4 percent). An estimated 17.2 million Americans lived in households where members experienced “very low food security” last year, meaning that, for instance, they had to skip meals or eat less because they lacked money for food at some point in the year. The very low food security rate among households remained unchanged from 2013, at 5.6 percent. The new figures show that millions of Americans are struggling, despite signs that the economic recovery is reaching more households. Wage growth remains slow. Food banks are seeing increased demand this year and expect to distribute more food in 2015 than in 2014 or 2013, the Associated Press reported recently. Given that food insecurity remains high, it’s no surprise that participation in SNAP — which helps millions of Americans afford adequate food — is also above pre-recession levels, though it’s fallen over the last two years. SNAP expands during economic downturns as more people become eligible and then contracts as the economy strengthens. Food insecurity will likely rise significantly in 2016 among able-bodied adults without dependents, roughly 1 million of whom risk losing SNAP as a time limit now waived due to high unemployment returns in most states. These individuals will lose benefits after three months if they aren’t working 20 hours a week or participating in a work program, even if they are looking for work. The loss of this crucial food assistance will likely make it harder for many of these individuals — many of whom are extremely poor and receive little if any other assistance — to afford food. GRAFTON, N.D.—Dave Moe has seen elderly neighbors and friends who, living on fixed incomes, have struggled to pay for weekly and monthly necessities. So, the Grafton businessman is establishing a nonprofit, the Elderly Relief Fund, and collecting monetary donations to help senior citizens pay for food, fuel or utility bills. "It's just something I've thought about for a long time," he said. "I've seen elderly come in, especially during the holidays. And you can tell they're just strapped financially. It breaks my heart." Moe launched the charity program last weekend in a Facebook posting and by setting aside $250 toward the cause. Donations—cash and checks for $50, $100, $200, $250 and more—have been pouring in ever since. He is in the process of establishing a nonprofit, and is organizing a committee, comprised of Grafton-area bankers and other officials, to oversee the fund and decide how to distribute the proceeds. The initial goal is to identify recipients and provide them with gift cards to local grocery stores or gas stations, or to help pay winter utility bills, Moe said. The program is not limited to Grafton residents. Moe's plan is to reach people in communities throughout Walsh County. So far, the committee members are: Jim Dusek, Wells Fargo Bank; Ann Kohler, First United Bank, Grafton; Ryer Stark, Choice Financial; Amy Vollrath, North Star Community Credit Union; and Julie Campbell, director, Walsh County Job Development Authority. Moe hopes to find another two or three for the committee. Moe said initial discussion has targeted Thanksgiving for the first distribution. "Maybe we can provide money for a full-course meal at Thanksgiving," he said. Kate Kenna, director of Northeast Human Service Center in Grand Forks, said it's a unique grassroots program that could fill a niche. "It sounds like a cool idea," she said. "It seems like there's a lot of self-neglect taking place, where people are not buying food for themselves." According to the most recent U.S. Census Bureau's Five-Year American Community Survey, 10.8 percent of people age 65 and older—or 10,112 individuals—in North Dakota have incomes below the federal poverty level. In Walsh County, the percentage is 10.6 percent—or 227 residents. Some 561 working age adults, ages 18 to 64, and 362 children were considered living in poverty in the county. The 2015 federal poverty level is $11,770 annually for a household of one, and $15,930 for a household of two. North Dakota has the nation's ninth lowest poverty rate, according to a recent Wall Street Journal report, with the state's median household income reaching $59,029 in 2014, an increase of $2,555 over 2013, the most significant rise in the nation. However, much of that that increase is attributed to explosive growth in North Dakota's Oil Patch in recent years, according to Carol Cartledge, economic assistance policy division director for the North Dakota Department of Human Services. The stage agency administers several economic assistance programs through county offices, according to Heather Steffl, DHS public affairs officer. They include the federal Supplemental Nutritional Assistance Program and Low Income Home Energy Assistance Program. In Fiscal 2014, SNAP served 138 adults 61 years or older in Walsh County, while LIHEAP served 142 households in the county. In Fiscal 2014, the Walsh County Nutrition Program served 460 older adults at senior meal sites and 141 through home-delivered meals. Cartledge said residents can access those programs and others through their local county social service offices. "They may refer people to other groups, such as food pantries and other resources," she said. Still, sometimes there's a need for more, said Vollrath, North Star's Grafton branch manager and a member of the new relief fund committee. "I think it's a great cause," she said. "There's a lot of people in need of something like that, especially at holiday time." The timing, number and amount of distributions will depend on how much money people are willing to donate—and whether the fund can be sustained over a long period of time, said Moe, who has not set a monetary goal. "I'd love to pull in $10,000," he said, "but I don't have a clue. It could be less. It could be a lot more. Hopefully, it'll catch on not just here, but in other towns." A non-profit account is in the process of being established at a Grafton bank. Until then, donations are being accepted at: Country Smokehouse; % Elderly Relief Fund; 115 W. Fifth St. Grafton, N.D. 58237. This article originally appeared on the 1:1 Fund blog. In the past few weeks, millions of kids have folded up their beach towels, brushed the sand out of their hair and headed back to school. Some of them are just starting their first days of kindergarten. Some of them are high school seniors, looking forward to crossing the graduation stage and setting off on their own in just a few short months. But all of them can benefit from college savings. Why? Most obviously, students with some savings set aside for college are less likely to accrue a crippling student debt burden. This means that, after they graduate, these students will likely start out on a more secure economic footing. Interestingly, although student loans are intended to help students get a college degree, only 35% of students with over $20,000 in loans actually graduate from college, compared with 60% of students with less than $10,000 in loans. So not only does debt put students at a financial disadvantage after college, but it may hurt their chances of completing a degree at all. But college savings doesn’t just benefit students at age 18 when they finally start making tuition payments. Research shows that low-income children with college savings do better academically and are significantly more likely to expect to go on to college than children without savings. For example, among high school students who expect to go to college, those with a college savings account are four times more likely to actually attend than those without an account. This suggests that when kids know there is money in the bank set aside for their education, they believe that they really can go to college and are more motivated to study hard to make their college dreams a reality. At the 1:1 Fund, we want to help make those college dreams a reality, too. That is why we work with Children’s Savings Account (CSA) programs around the country to provide the matching funds that encourage low-income students and their families to keep saving. This week, we are teaming up with three of our partners in San Francisco, St. Louis and Jackson, Mississippi to raise matching funds for student savers and keep their nest eggs growing. Now through Saturday, the 1:1 Fund will provide a dollar-for-dollar match of donations of up to $500 to each of these three CSA programs. Give this week and we will double your donation, allowing even more children to benefit from the power of savings. Also, if you have never donated, now is your chance! In order to get more people involved in the growing CSA movement, the 1:1 Fund is offering a $500 bonus for each partner that gains at least 25 first-time donors this week. Whether your gift encourages a six-year-old in St. Louis, a kindergartener in San Francisco or a fourth grader in Mississippi, a donation to a 1:1 Fund partner this week goes even further. Help a child start the school year off right by donating today. Below is CHN’s statement on the new poverty data released today by the U.S. Census Bureau. We’ve also included tweets to share and our First Look at the data, which shows that economic recovery since the end of the Great Recession has been unshared. “The number of Americans living in poverty remained stuck at more than 46 million last year, not statistically different from 2013. Disappointingly, economic growth is hardly reaching America’s poor. The poverty rate is down from its peak of 15.1 percent in post-recession 2010, but, at 14.8 percent, is well over the 12.5 percent rate in 2007, before the Great Recession took hold. There are still more than 15 million poor children, more than one in five. Damaging inequality continues, with more than one in three African American children (36 percent) and about one-third of Latino children (32 percent) living in poverty. For white non-Hispanic children, the poverty rate was 12.3 percent. There are many troubling signs: nearly one in ten of our children is living below half the poverty line (the official threshold is $18,850 for a family of three). Hardship is broadly shared: for another year, one-third of the nation is uncomfortably close to poverty (below twice the poverty line). “While economic gains are not reaching the poor in a sustained way, government programs are helping. The Census Bureau’s new report shows that low-income tax credits, nutrition and housing programs, Social Security and SSI are among the programs that work to lift families out of poverty. Even counting only part of the Child Tax Credit, the Census Bureau finds low-income tax credits lift more than 5 million children out of poverty. SNAP lifts a similar number of people out of poverty. Congress’ first order of business should be to protect and expand these programs. And yet, with only a few days before the end of the fiscal year, the Congressional majority is divided and apparently paralyzed. Every day they fail to act risks stalling the modest progress only just beginning to reach the poor. Click here for CHN’s First Look and visit our Census Poverty Data resource page for more data and additional resources as they become available. The post Unshared Recovery: 46 Million Poor; Poverty Rate Unchanged appeared first on Coalition on Human Needs. Could the "Money Pool" Model Help Low-Income Families Reach Their Savings Goals? Since the late 1990’s, Individual Development Accounts (IDAs) have been linked to programs that have been offered by agencies across the country to help low-income families reach savings goals. And although the model is sound, participant completion rates have notoriously been low. It has been speculated that the reason for these low completion rates are threefold: the lack of structure and accountability placed on the participant, easy access to saved funds and the protracted completion date, which is often several years after the participant enters the program. Most IDA participants must take part in an extended program—some as long as five years—during which expectations can be set very low and, above all, the finish line appears light years away. The result is that the participants’ motivation wanes over time, while unexpected expenses appear, making the partially-saved funds an easy target for early withdrawal. With eMoneyPool’s community finance tool, a technologically-updated version of a traditional money pool (you might know them as a Tanda, Cundina or Susu), we have been able to remove the challenges of traditional IDA programs, resulting in a 99% program completion rate. The best part is that the tool is free for agency partners from all sectors, including nonprofits. They are not required to register and can use eMoneyPool easily and effectively. Most importantly, it’s scalable, so anyone offering IDAs across the country can tap into this tool with little to no training and reap the benefits of a 99% completion rate. First, a quick review of how a traditional money pool works. A group of 10 people agree to contribute a fixed amount of money (say $100) on a fixed interval (say monthly). Every time the group pools the money together, one member of the group receives those funds to spend on anything they need. The next month, the same 10 people again make their contribution and the $1,000 is taken by the next member in the circle. This continues until everyone in the group has received their lump sum of money. By design, eMoneyPool’s model creates a short-term, structured plan, which locks participants into the dates of their expected savings contributions. Also, by nature of working in a group of people who are all depending upon each participant’s monthly contribution, a high level of accountability, or “social pressure,” is placed upon the participant to make payments on time. Finally, there is no access to the funds until the specified payout date, which removes the issue of participants “dipping” into saved funds. To prove the validity of the concept, eMoneyPool partnered with a local non-profit, Local First Arizona, which offers an IDA program to aspiring small business owners, known as the Business Accelerator Program. The participants must take part in a six-month program, which includes a curriculum covering topics such as Creating a Business Plan, Marketing and Tax Preparation. Since 2013, the program has also required that participants join a money pool in order to meet their IDA savings goal and qualify for their one-to-one savings match. This specific accelerator program requires the participants make bi-monthly payments over five months, but the money pool platform can be offered in a variety of options, such as monthly payments of about $50. As of this writing, five classes, or 60 individuals, have participated in the program and despite some of the participant’s concerns about their ability to successfully manage the payment schedule, have demonstrated a 99% completion rate. By applying technology to an age old practice, used all over the world due to its ability to create a mix of forced discipline and peer pressure, we stumbled upon one potential solution to the IDA puzzle. For more information or questions, contact Luis Cervera at luis@emoneypool.com. Luis Cervera is President and Co-Founder of eMoneyPool, an online community finance tool based on the lending circle or ROSCA. eMoneyPool has perfected the traditional model known around the world by applying technology in order to make it easier, safer and more efficient while guaranteeing the entire process. The eMoneyPool platform helps individuals reach their short-term financial goals while building a positive payment history which is accepted by its lender partners. 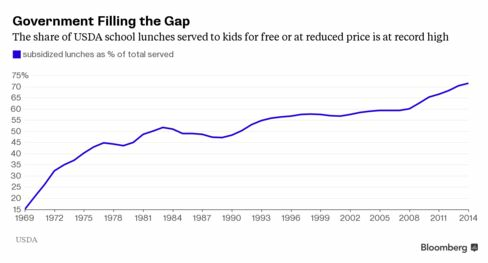 Even as the recession ended more than six years ago, the ranks of American children poor enough to be eligible for free school lunches is on a surge. U.S. Department of Agriculture school-lunch data going back to 1969 show a steady increase in the percentage of participants relying on government subsidies for their midday meal. The pace of the increases picked up in the aftermath of the 2008 financial crash. According to thresholds set in 1981, children from families with incomes at or below 130 percent of the federal poverty level are eligible for free meals, while those from families with incomes between 130 percent and 185 percent qualify for reduced-price meals and can be charged no more than 40 cents per lunch. An elevated poverty rate, combined with stepped-up efforts to bring children into the program, has increased the number of free lunches, said Crystal FitzSimons, school programs director for the Food Research and Action Center in Washington DC, which advocates for expanded nutrition aid. While the child poverty rate declined to to 19.9 percent in 2013 from 22 percent in 2010, it's still higher than before the crisis, Census data show. Beginning in 2008, school districts were required to automatically enroll children from families eligible for food stamps in lunch programs. In 2010, Congress passed additional legislation aimed at boosting access to subsidized meals for the poorest kids. "Even as the economy recovers, it isn't trickling down" to poor families who rely on the school-lunch program, FitzSimons said. "You have increased need among low-income households." Legislation authorizing the government's school-lunch program is due to expire Sept. 30. Agriculture Secretary Tom Vilsack is speaking in Washington this week and next, urging Congress to take up legislation supporting school meals. This Friday join MomsRising, Coalition for Human Needs, and National Women’s Law Center for a #FoodFri Tweetchat from 1-2pm ET. During this tweetchat we will be discussing the 2014 USDA hunger data, as well as the newly released Census data on poverty and healthcare, and how it relates to the upcoming budget and sequester debate. Join us with resources, ideas and tweets by adding the hashtag #FoodFri to all your tweets at 1pm ET on September 18th. How do #hunger & #poverty data relate to upcoming #budget fight? Join us 9/18 1pmET for #FoodFri to find out! Be sure to follow @MomsRising, @CoalitiononHN and @NWLC and the hashtag #FoodFri to participate. The post #FoodFri Tweetchat 9/18: How do hunger & poverty data relate to upcoming budget fight? appeared first on Coalition on Human Needs. Without access to nutritious food, children face risk factors for major diseases early in life. This “food insecurity” can also lead to family and psychological problems. Nearly 20 percent of U.S. households with children lack access to foods that meet the nutritional requirements for an active, healthy lifestyle. This “food insecurity” comes in many forms. It includes poverty where a family can’t afford nutritious foods, living in a “food desert” where quality food isn’t available, or having too much junk food in a child’s diet. According to a new study published in The Journal of the American Osteopathic Association the number of households with children who had severely low levels of food security nearly doubled between 2003 and 2010. The researchers said food insecurity can lead to physical impairments, including obesity, as well as psychological issues and family disturbances. The study’s co-author Christopher Taylor, Ph.D., associate professor of medical dietetics and family medicine at The Ohio State University College of Medicine, says food insecurity is absolutely a preventable health threat and parents play a huge part in this. Researchers examined 7,435 participants in the National Health and Nutrition Examination Survey. They found that children raised in low- or very low-food secure households were as much as 1.5 times more likely to be obese. Besides being overweight, the children had central obesity — excess fat around the stomach and abdomen. That increases a person’s risk of a group of factors linked to cardiovascular disease, stroke, and the precursor to developing type 2 diabetes. Beyond the physical ramifications of poor nutrition, new research adds to the growing body of evidence of the importance of physical activity and brainpower. A new study published in PLOS One shows children who are aerobically fit have a better academic performance, especially in math, than children who are unfit or overweight. Ericca Lovegrove, R.D., a clinical dietitian with the Center for Healthy Weight and Nutrition at Nationwide Children’s Hospital, Columbus, Ohio, helps educate parents on better eating habits, including meal planning. “Food assistance programs can provide a bridge to assist those with limited resources to eat a healthy diet,” Taylor said. Overall, these children need to be served fewer cheap processed foods like sodium-rich ramen noodles, and more quality inexpensive foods like protein-rich peanut butter, eggs, and beans. It could begin as simply as choosing peanut butter cracker sandwiches at the corner store instead of a packaged pastry, Lovegrove said. “We put an emphasis on nutritional quality, which is most important,” she said. 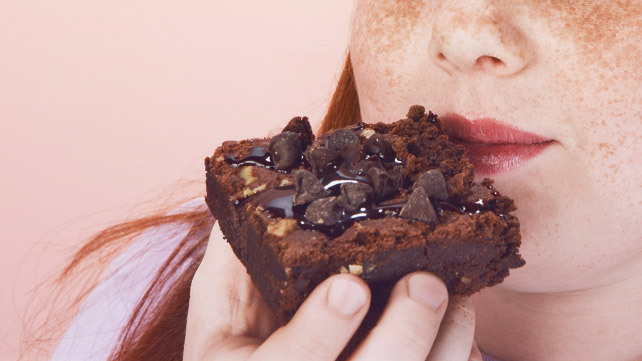 Kids are notorious for wolfing down their meals, but new research suggests this, too, can affect a person’s ability to metabolize their foods. A new study published in the Journal of Epidemiology examined the eating habits of 8,941 Japanese residents. Researchers found the faster a person ate, the likelihood of developing metabolic syndrome increased. This is likely because eating quickly leads to overeating because the stomach doesn’t have time to feel full. “Eating slowly is therefore suggested to be an important lifestyle factor for preventing metabolic syndrome,” the study concluded. This post originally appeared on Rooflines, the Shelterforce blog. The first two are obvious. When talking to housing experts, advocates and local leaders, the idea of financing a home like a car makes little sense to them. They often ask: Why would Congress rubber-stamp a 14% home loan? Why doesn’t Fannie or Freddie develop tools to support innovative loan programs that both protect homeowners and expand competition in the lending market? In a recent blog post, Melissa Grober-Morrow shared tips about choosing the right partner to integrate financial capability services. She offered CFED's planning guide as a tool to help you decide if you're ready to shift from dating to a serious relationship. Now that we've found our partner, it's time to tackle co-parenting. To continue the metaphor from last week’s post, assume just for a minute that the clients we serve are our children, and when we partner with another community organization, we're both bringing kids to the marriage. How will that work? How will we approach setbacks and successes? What is it like for the kids when they bounce from one home to another? These are the challenging questions CFED is helping us tackle through the Community Financial Empowerment Learning Partnership (CFELP). For years we've heard chatter from the funding community about collaboration and shared outcomes. But how do you make that happen when each organization has its own focus and goals—its own approach to raising the kids? At the YWCA of Metropolitan Dallas (YW), we've had our share of challenges. We've stepped into partnerships where the highest level of leadership is onboard, but the staff charged with coordinating the services don't see the value or are overworked and overwhelmed. We’ve eagerly walked into relationships where on the surface the partnership seems like a natural fit, but at the end of the day we should have spent more time dating, more time talking through how we would handle tough situations. Through CFELP tools and technical assistance, we are having important conversations with our partners New Friends New Life and Metrocrest Services at the start of our partnership. We are learning about one another's work culture and service delivery methodology. We are talking through where we make compromises so that our relationship is seamless for the “kids”—our clients. Like parents, we are in this together for the women and men who come to us ready to change their lives for the better. There are a number of policies and processes that have to be discussed before we can have a successful partnership that truly benefits clients. For example, what does each agency's intake process look like? Should we make a client whose off-work time is precious or who lacks transportation travel from location to location to fill out separate intake forms? Or can we agree on a set of client data that is collected at one location and shared with partners, streamlining the process so that the client makes one stop and is ready for services at any location within the partnership? And how do we handle a client who struggles, perhaps breaks the rules? We must agree early on about our response. We all make mistakes from time to time, and we may even take a step or two backwards. What we don't want is a kid who tells Dad they made a mistake, with the expectation that he doesn’t tell Mom. We need to plan ahead for how we address these situations so that we work together to find a shared solution. To truly share outcomes we must be clear about what client success looks like for each partner agency. For example, at YW, we measure success as clients reaching key steps toward their financial goal. New Friends New Life focuses on employment and personal growth through counseling. When we understand one another's milestones, we join in the client’s success. Co-parenting is not easy. But when you invest the time up front in your partnership, the results can be extraordinary for families, neighborhoods and communities. Authors note: in our day to day work, we do not consider our clients “children.” This word choice is only intended to illustrate the point about service providers working closely together in a true learning partnership. Jennifer M. Ware is Chief Executive Officer of YWCA of Metropolitan Dallas. Previously, Jennifer served as Chief Development Officer for Girl Scouts of Northeast Texas, an agency serving 42,000 girls across 32 north Texas counties. She has also worked with organizations such as the Dallas Children’s Advocacy Center and Baylor Health Care System Foundation. Jennifer is a member of Dallas Assembly and a graduate of Leadership Texas, Leadership Plano Class 22 and holds a BA in Psychology from Austin College. We Advocate for Microbusiness. Your Data Can, Too. We live in an increasingly data-driven world. At CFED, where we’ve been working for more than 35 years to advocate for the value of business ownership as a path to economic opportunity, we have witnessed first-hand the growing demand for data. Funders and policymakers want to understand whether and how microbusiness ownership can help address issues including job creation, job quality, financial exclusion, rising inequality and the racial wealth gap. Serve high percentages of people of color, and therefore are effective in targeting communities that face the highest levels of income and wealth inequality. In FY2013, 74% of clients served were non-white. Have significantly expanded the number of loans made over the past several years in response to the decline in bank lending to small businesses since the Great Recession. Between 2012 and 2013, the number of loans disbursed increased by 61%, and the dollar volume of loans disbursed grew by 36%. Have a median cost per individual served of $1,480, and are therefore cost-effective relative to many other economic development strategies. Have successfully managed portfolio risk with a net loan loss rate of 4% in 2013. The U.S. Microenterprise Census is the most comprehensive source of information on the microenterprise field. Its ability to provide the robust data needed by CFED— and all those who work in and advocate for the field—depends on the willingness of organizations in the field to participate by sharing their data. The annual census campaign will conclude on September 11. If your organization offers microenterprise training and technical assistance, IDAs for microenterprise or microloans, and you have not yet submitted your data, please take the survey! Even if these pieces are only one part of your work, your data are valuable. If you are a funder, policymaker or supporter of the field, encourage programs you work with to report their data here. Together we can support business ownership as a pathway to financial security for many more Americans. The Fargo-Moorhead Chamber of Commerce has taken some solid first steps to helping improve the economic security and prosperity of North Dakotans living the Fargo-Moorhead Region. While expanding the Risk Mitigation Fund and making rental units and housing available for working families are impressive and ambitious goals, there are some warning signs regarding these two options that must be faced. First, the Landlord Risk Mitigation Fund, a new and innovative program based on ideas coming from Oregon, was set up to provide a housing safety-net for our most vulnerable populations. People with disabilities, mental health issues, infirmities due to age, and children, need help first and foremost since they are the most vulnerable to homelessness, food insecurity, and health insecurity. Housing and support for these populations must be considered in concert with industry’s need for housing for their workforce. Second, the FM Chamber of Commerce advocating for an increase in rental and housing units for working families of low-income is sound policy. But, planning on placing them adjacent to major employment centers might result in neighborhoods divided. Why not have mixed-use housing plans put in place, where everyone would have equal access to services, including entertainment, medical, transportation, and food? It is great that the FM Chamber of Commerce is looking at the community support structures in place when examining their workforce needs. They should likewise look strategically to the future and address the quality of life of their employees and communities by exploring effective multi-use planning, including expanding transportation. The FM Regional Workforce Study has placed that region at a crossroads. They have the ability to move their communities in a direction that helps everyone, rather than just a few. Next week we will be looking at how the FM Chamber of Commerce plans on taking on the statewide problem of lack of access to childcare. CFED believes the Earned Income Tax Credit (EITC) is a vital tool for helping create an opportunity economy, inclusive of low-income families. As we argued recently, the EITC—a refundable tax credit that helps boost the income of working-class families—is much more than it seems. At a January event on Capitol Hill co-hosted by CFED, sociologist Kathryn Edin described the findings of a book that found the EITC is more than an income booster: it helps families save, invest and move up the economic ladder. But as great as the EITC is, it was not built to contend with the recurring financial shocks that define low-wage life in America. The book authors suggested strengthening the EITC on this front, and we at CFED jumped at the idea, working with a number of our partners to develop a new proposal: the Rainy Day EITC. Since our January Capitol Hill event, we’ve been working with the authors of the book, tax preparers from the Taxpayer Opportunity Network, and researchers and advocates in the financial security field to develop a new proposal that would help buffer low-income families from recurrent financial shocks. The Rainy Day EITC would give low-wage workers a new tool to build emergency savings at tax time. The policy was designed to work as simply as possible: EITC-eligible workers would be given the option on their tax return of opting into the Rainy Day EITC. For a family that would have initially received $2,500 through the EITC, they would instead receive $2,000 now and defer $500 for later. Six months later, the IRS would automatically deposit that $500, plus a 50% match, into the family’s bank account. The value of the proposal is that it maintains the benefits of the lump-sum EITC payment while addressing the fact that many low-wage workers don't have emergency funds. The $750 that a family would receive halfway through the year is enough to pay off a surprise medical expense or fix a broken car without having to rely on high-cost, often predatory payday loan products. In other words, the Rainy Day EITC is a clear way to protect consumers and boost financial security at tax time and beyond. Of course, the Rainy Day EITC isn’t a silver bullet. Workers still need good jobs with good wages and good benefits. And, many low-wage workers need their entire tax refund as soon as possible, meaning not all workers will opt in. But for others, this reform would provide a new tool to help them achieve financial security year-round, rather than just during tax-season. As we wrote in The Hill when we released the proposal, Congress has the power to create this powerful tool. By our estimate, the initial cost would amount to only about a 1.3% increase of current spending on the EITC. We are now talking with congressional offices to show them how this modest investment could help millions of low-wage families. We’re hopeful that, with the right champion, we can convert this new idea into law.